AMD is really putting the pressure on Nvidia now with its second release of the new AMD HD 7000 graphics card generation, the AMD Radeon HD 7950. Nvidia is still sitting back waiting for the right moment to strike back, but can it recover from these two quick blows? 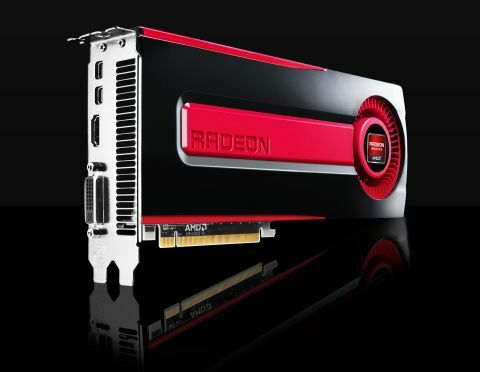 Well, we say quick - it's been well over a month since AMD launched its first card of this generation, the AMD Radeon HD 7970. That was a surprise given that, pre-Christmas, we were expecting both cards to hit the streets at the same time in the first week of January with a possible dual-GPU iteration coming around now. AMD though decided to give its top-of-the-line, £500 AMD HD 7000 card a bit of breathing space at the start of its life, and now that the AMD Radeon HD 7950 is sat here in our labs it's easy to see why its release was delayed. Essentially it's almost as good a card for over £100 less. So AMD's claims to be delaying so it could wait for AMD Radeon HD 7950 units to be in the market (despite launching its big brother, the AMD Radeon HD 7970 well before you could even lay eyes on one) seem to be rather thin. We think it's more likely AMD realised even fewer people would pick up a £500 graphics card when there was one for £350 that could do the same job practically as well. To be fair though this isn't the first time this has happened; the previous generation had exactly the same problem in the two top-end Cayman cards – the Radeon HD 6950 and Radeon HD 6970. There was precious little difference between the two cards in benchmarking terms, and with some judicious use of BIOS tweakery and ROM flashing fun, there ended up being precious little difference between them architecturally too. But there must be some differentiating factors, some reason for the £150 price difference. So, what has AMD chopped out of the AMD Radeon HD 7950 Graphics Core Next GPU to make the grade?